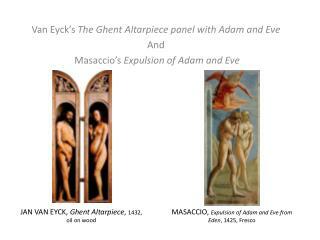 The Acadians, Acadia, The Expulsion and the birth of Nova Scotia. 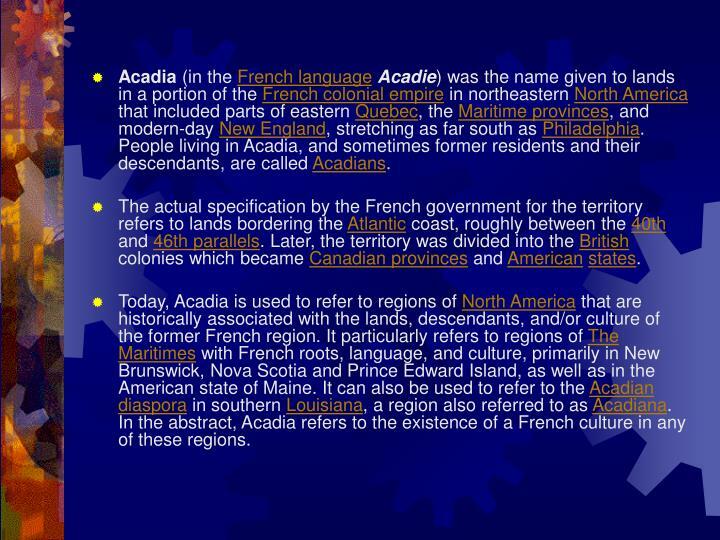 Acadia (in the French languageAcadie) was the name given to lands in a portion of the French colonial empire in northeastern North America that included parts of eastern Quebec, the Maritime provinces, and modern-day New England, stretching as far south as Philadelphia. 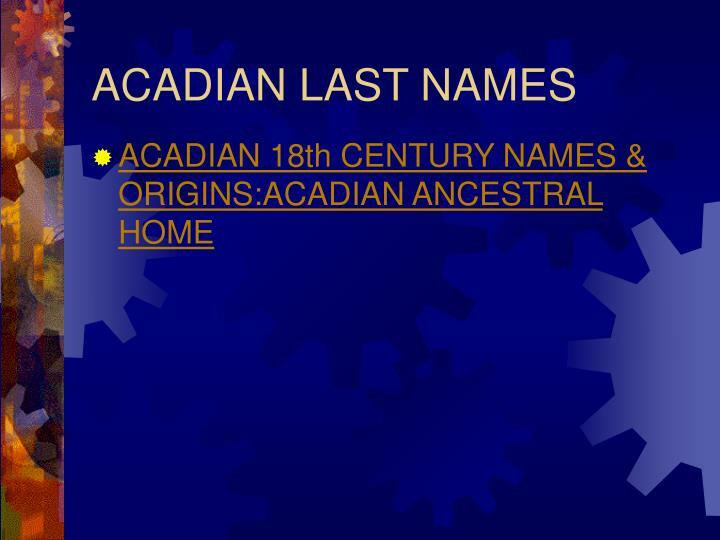 People living in Acadia, and sometimes former residents and their descendants, are called Acadians. 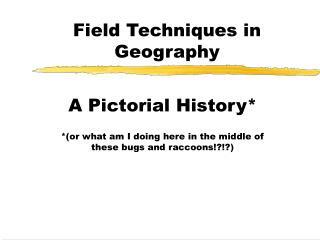 The actual specification by the French government for the territory refers to lands bordering the Atlantic coast, roughly between the 40th and 46th parallels. 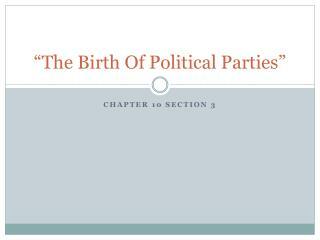 Later, the territory was divided into the British colonies which became Canadian provinces and Americanstates. 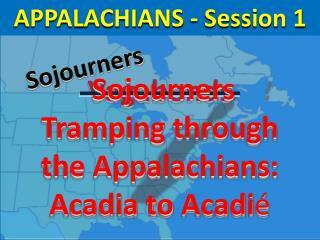 Today, Acadia is used to refer to regions of North America that are historically associated with the lands, descendants, and/or culture of the former French region. 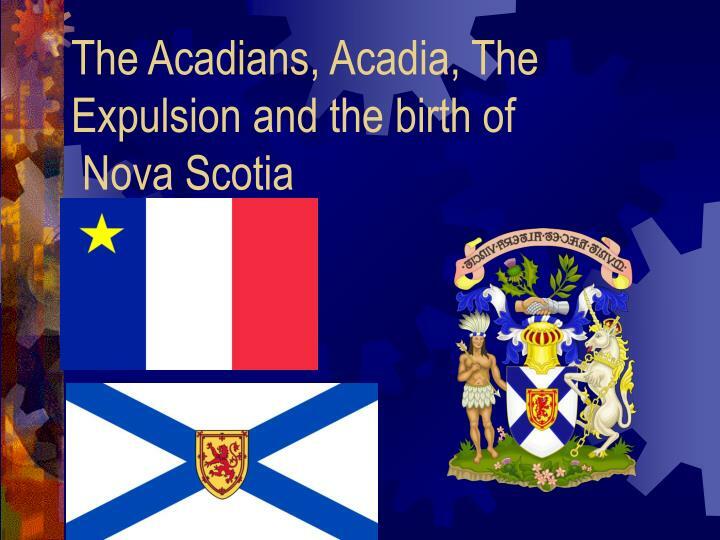 It particularly refers to regions of The Maritimes with French roots, language, and culture, primarily in New Brunswick, Nova Scotia and Prince Edward Island, as well as in the American state of Maine. 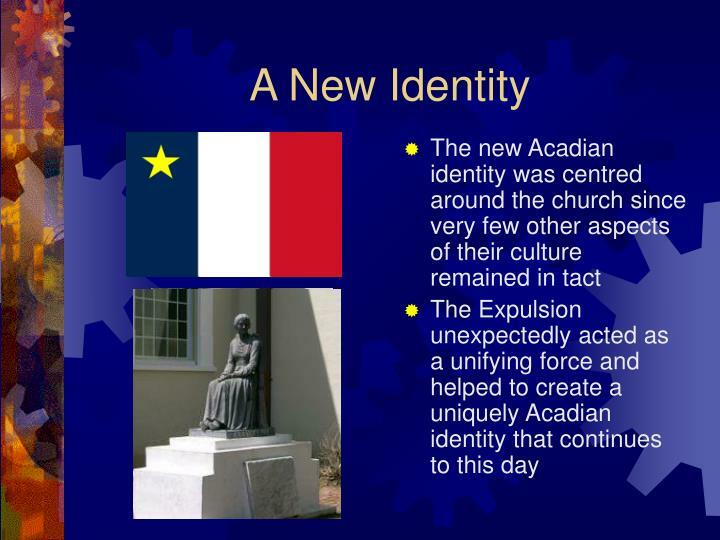 It can also be used to refer to the Acadian diaspora in southern Louisiana, a region also referred to as Acadiana. 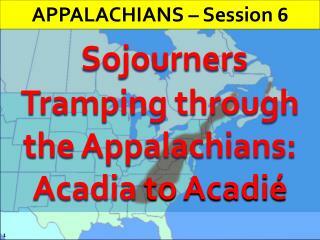 In the abstract, Acadia refers to the existence of a French culture in any of these regions. 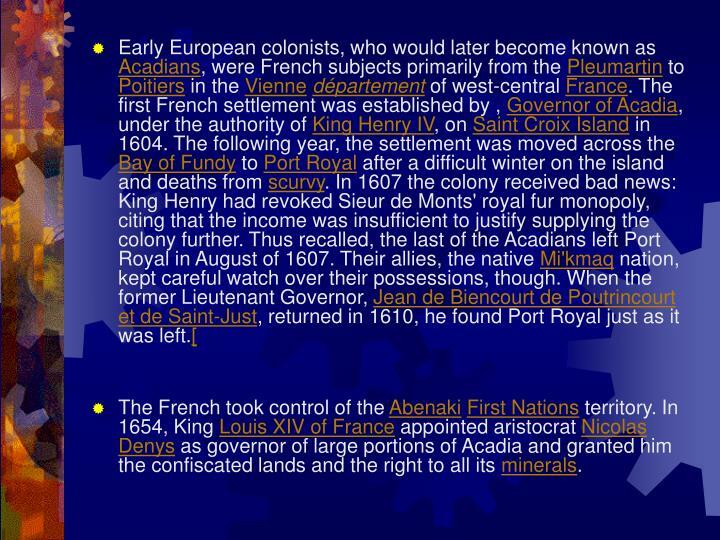 The French took control of the AbenakiFirst Nations territory. In 1654, King Louis XIV of France appointed aristocrat Nicolas Denys as governor of large portions of Acadia and granted him the confiscated lands and the right to all its minerals. The Netherlands asserted sovereignty over Acadia in 1674 after privateer Jurriaen Aernoutsz captured the forts at Pentagoet and Jemseg. Control over the region reverted to France when Aernoutsz's appointed administrator, John Rhoades, was captured by New England within a few months. The Dutch West India Company continued to assert a paper claim over Acadia until 1678, appointing Cornelius Van Steenwyk as its governor, although they never successfully recaptured actual control of the territory. 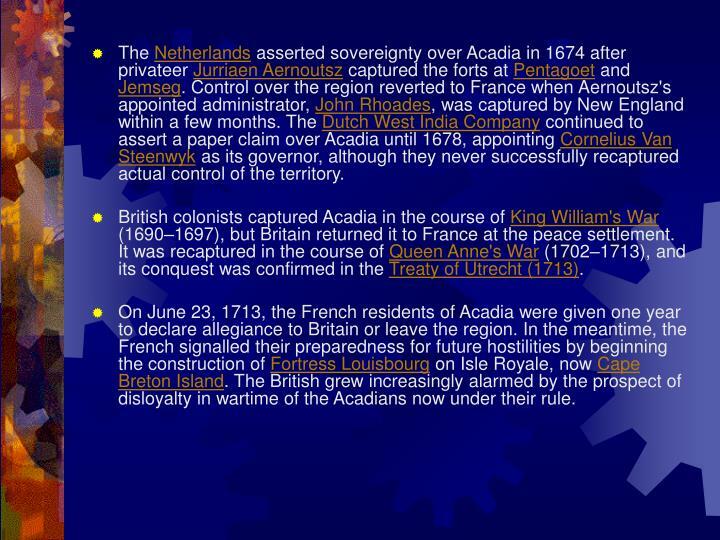 British colonists captured Acadia in the course of King William's War (1690–1697), but Britain returned it to France at the peace settlement. It was recaptured in the course of Queen Anne's War (1702–1713), and its conquest was confirmed in the Treaty of Utrecht (1713). On June 23, 1713, the French residents of Acadia were given one year to declare allegiance to Britain or leave the region. 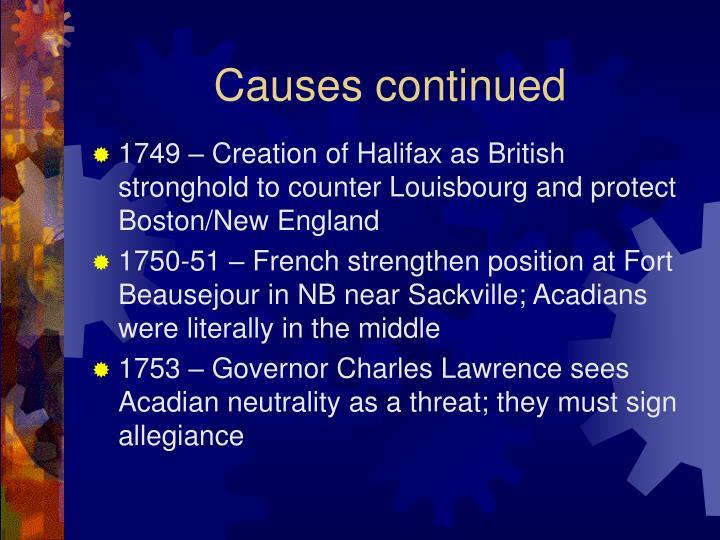 In the meantime, the French signalled their preparedness for future hostilities by beginning the construction of Fortress Louisbourg on Isle Royale, now Cape Breton Island. 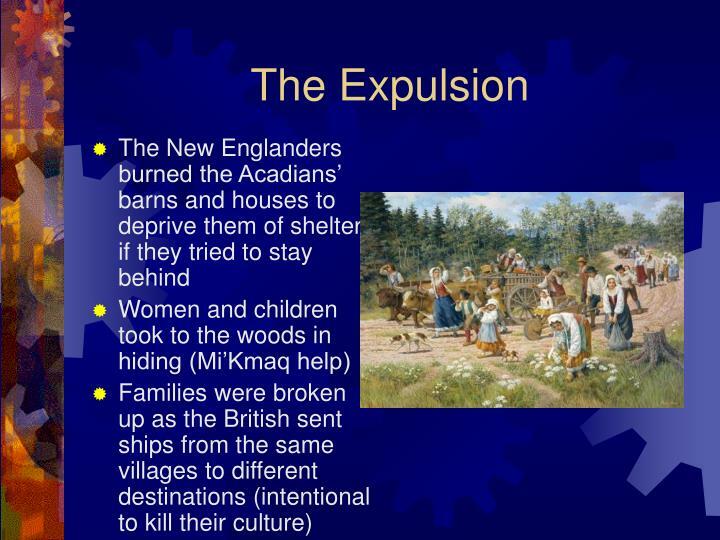 The British grew increasingly alarmed by the prospect of disloyalty in wartime of the Acadians now under their rule. 1713 – Treaty of Utrecht – ended war between Britain and France/Spain. 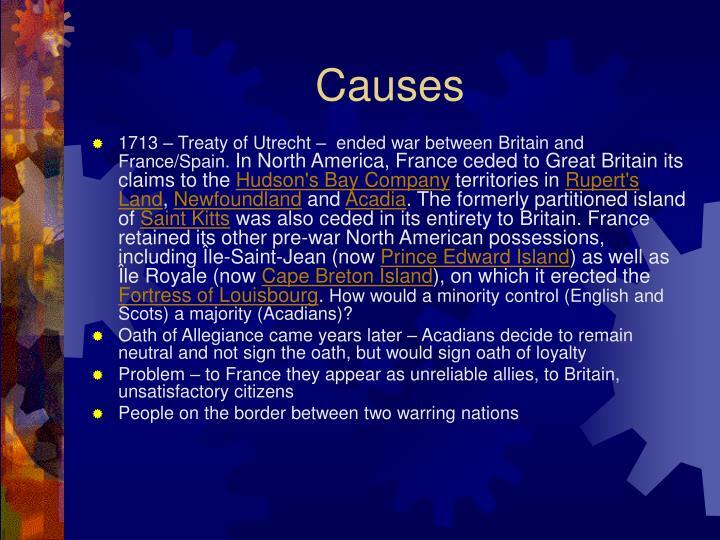 In North America, France ceded to Great Britain its claims to the Hudson's Bay Company territories in Rupert's Land, Newfoundland and Acadia. The formerly partitioned island of Saint Kitts was also ceded in its entirety to Britain. France retained its other pre-war North American possessions, including Île-Saint-Jean (now Prince Edward Island) as well as Île Royale (now Cape Breton Island), on which it erected the Fortress of Louisbourg. 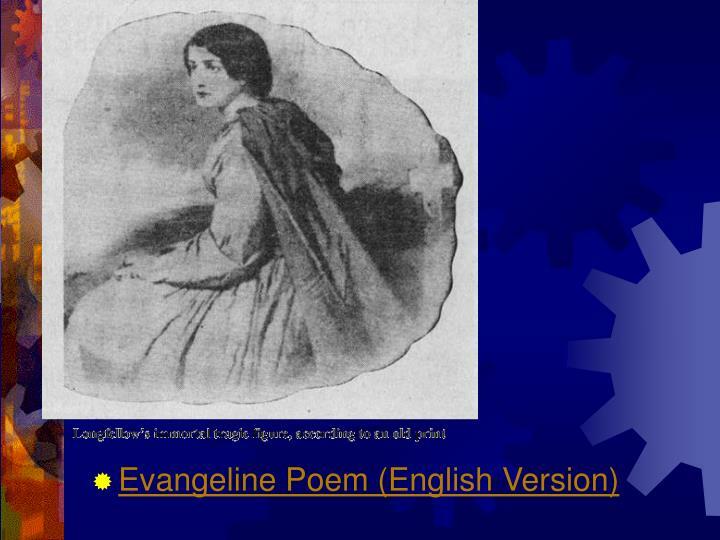 How would a minority control (English and Scots) a majority (Acadians)? 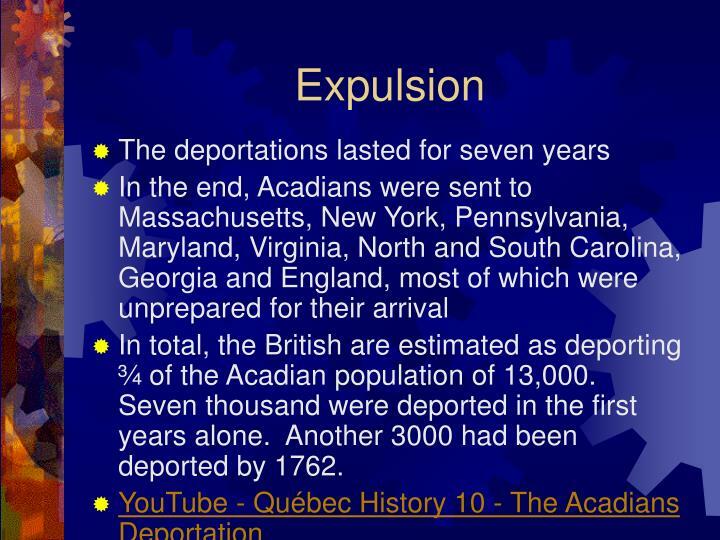 In total, the British are estimated as deporting ¾ of the Acadian population of 13,000. Seven thousand were deported in the first years alone. Another 3000 had been deported by 1762. 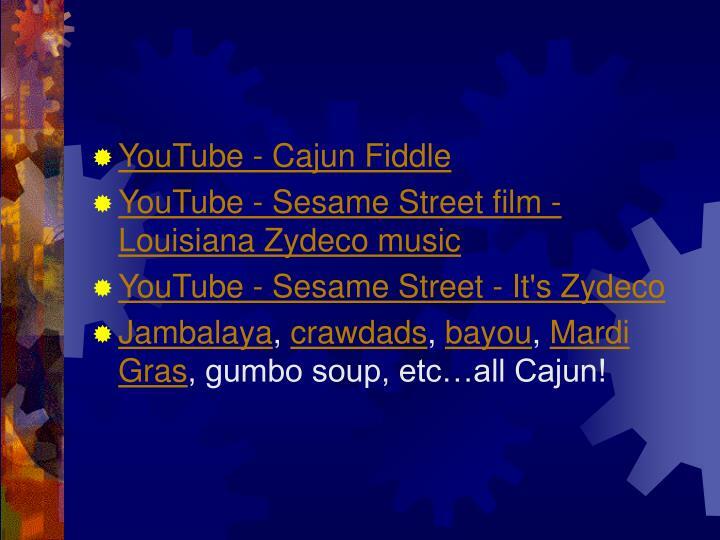 Jambalaya, crawdads, bayou, Mardi Gras, gumbo soup, etc…all Cajun! 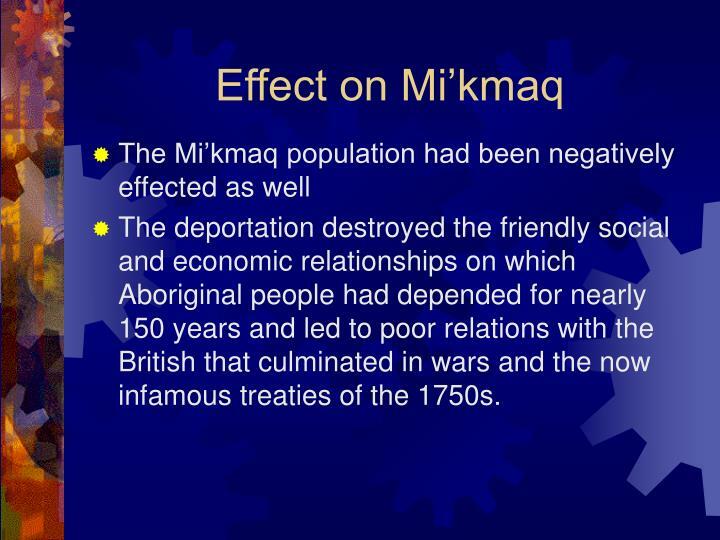 The deportation destroyed the friendly social and economic relationships on which Aboriginal people had depended for nearly 150 years and led to poor relations with the British that culminated in wars and the now infamous treaties of the 1750s. In 1620, the Plymouth Council for New England, under King James VI (of Scotland) & I (of England) designated the whole shorelines of Acadia and the Mid-Atlantic colonies south to the Chesapeake Bay as New England. 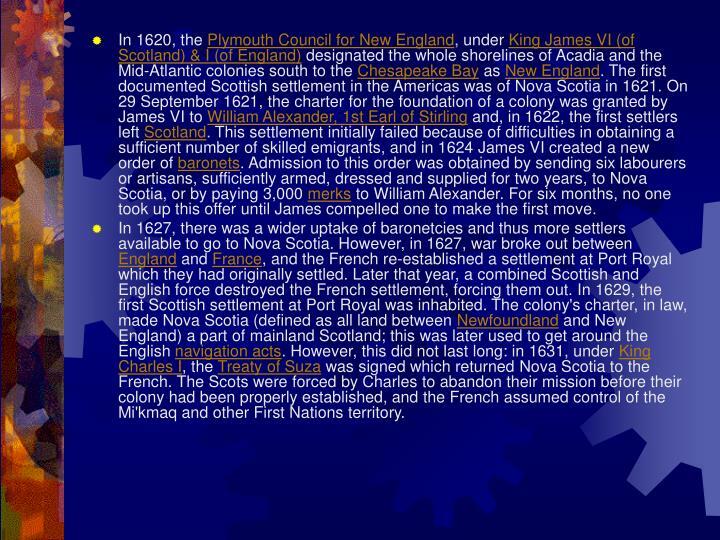 The first documented Scottish settlement in the Americas was of Nova Scotia in 1621. On 29 September 1621, the charter for the foundation of a colony was granted by James VI to William Alexander, 1st Earl of Stirling and, in 1622, the first settlers left Scotland. This settlement initially failed because of difficulties in obtaining a sufficient number of skilled emigrants, and in 1624 James VI created a new order of baronets. Admission to this order was obtained by sending six labourers or artisans, sufficiently armed, dressed and supplied for two years, to Nova Scotia, or by paying 3,000 merks to William Alexander. For six months, no one took up this offer until James compelled one to make the first move. In 1627, there was a wider uptake of baronetcies and thus more settlers available to go to Nova Scotia. However, in 1627, war broke out between England and France, and the French re-established a settlement at Port Royal which they had originally settled. Later that year, a combined Scottish and English force destroyed the French settlement, forcing them out. In 1629, the first Scottish settlement at Port Royal was inhabited. The colony's charter, in law, made Nova Scotia (defined as all land between Newfoundland and New England) a part of mainland Scotland; this was later used to get around the English navigation acts. However, this did not last long: in 1631, under King Charles I, the Treaty of Suza was signed which returned Nova Scotia to the French. 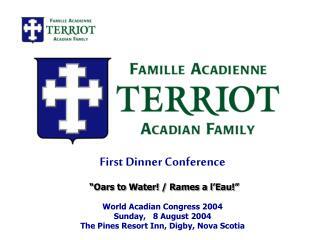 The Scots were forced by Charles to abandon their mission before their colony had been properly established, and the French assumed control of the Mi'kmaq and other First Nations territory. 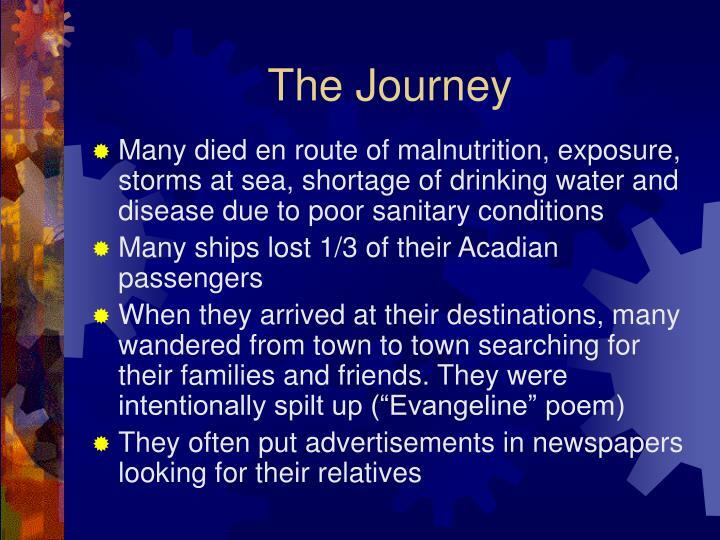 Ancestors of more than half of present-day Nova Scotians arrived in the period following the Acadian Expulsion. Between 1759 and 1768, about 8,000 New England Planters responded to Governor Charles Lawrence's request for settlers from the New England colonies. 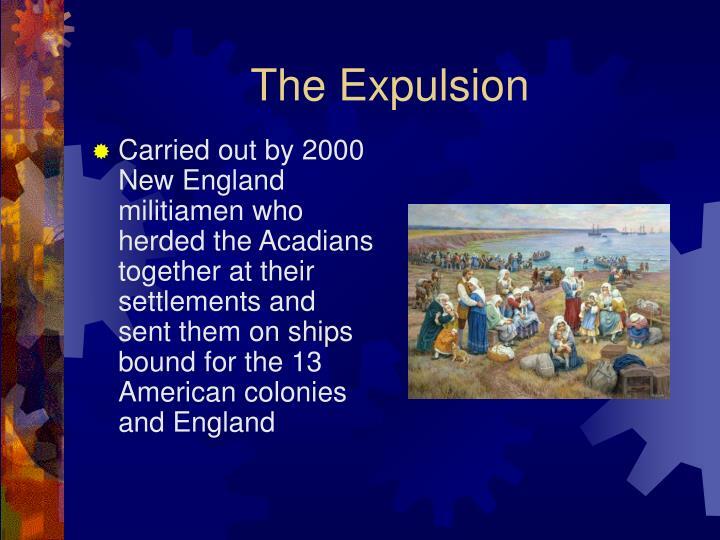 Several years later, approximately 30,000 United Empire Loyalists (American Tories) settled in Nova Scotia (when it comprised present-day Maritime Canada) following the defeat of the British in the American Revolutionary War. Of these 30,000, 14,000 went to New Brunswick and 16,000 went to Nova Scotia. Approximately 3,000 of this group were Black Loyalists, about a third of whom soon relocated themselves to Sierra Leone in 1792 via the Committee for the Relief of the Black Poor, becoming the Original settlers of Freetown. 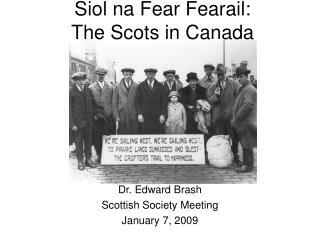 Large numbers of Gaelic-speakingHighland Scots emigrated to Cape Breton and the western part of the mainland during the late 18th century and 19th century. In 1812 Sir Hector Maclean (the 7th Baronet of Morvern and 23rd Chief of the Clan Maclean) emigrated to Pictou from Glensanda and Kingairloch in Scotland with almost the entire population of 500. Sir Hector is buried in the cemetery at Pictou. 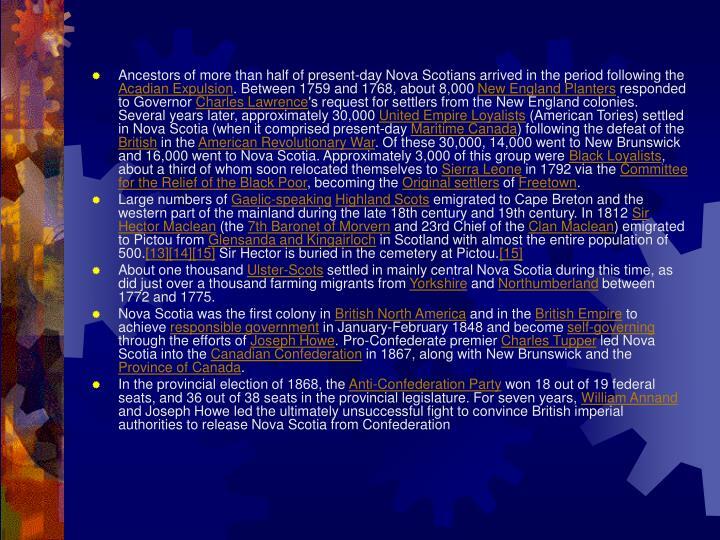 About one thousand Ulster-Scots settled in mainly central Nova Scotia during this time, as did just over a thousand farming migrants from Yorkshire and Northumberland between 1772 and 1775. In 1654, King Louis XIV of France appointed aristocrat as Governor of Acadia and granted him the confiscated lands and the right to all its minerals. English colonists captured Acadia in the course of King William's War, but England returned the territory to France in the Treaty of Ryswick at the end of the war. The territory was recaptured by forces loyal to Britain during the course of Queen Anne's War, and its conquest was confirmed by the Treaty of Utrecht of 1713. 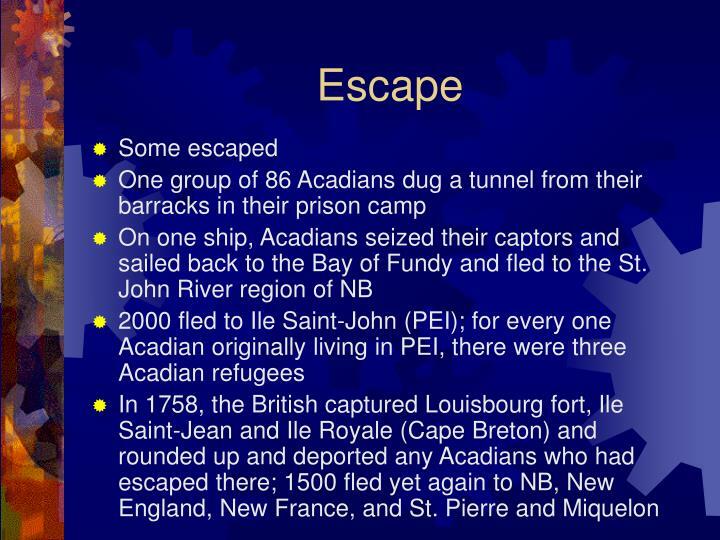 France retained possession of Île St Jean (Prince Edward Island) and Île Royale (Cape Breton Island), on which it established a fortress at Louisbourg to guard the sea approaches to Quebec. This fortress was captured by American colonial forces in 1745, then returned by the British to France in 1748, then captured again during the French and Indian War, in 1758. 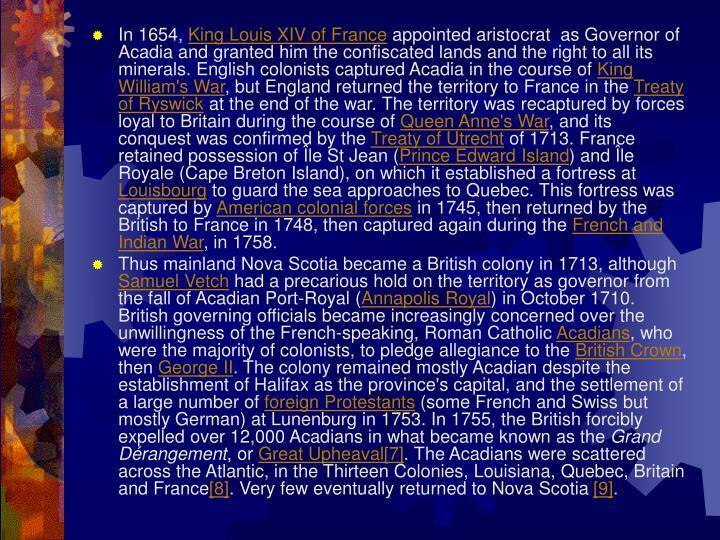 Thus mainland Nova Scotia became a British colony in 1713, although Samuel Vetch had a precarious hold on the territory as governor from the fall of Acadian Port-Royal (Annapolis Royal) in October 1710. 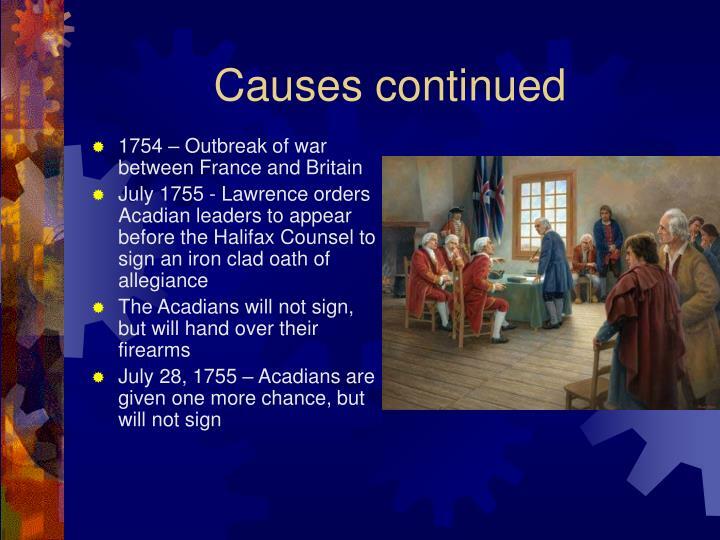 British governing officials became increasingly concerned over the unwillingness of the French-speaking, Roman Catholic Acadians, who were the majority of colonists, to pledge allegiance to the British Crown, then George II. 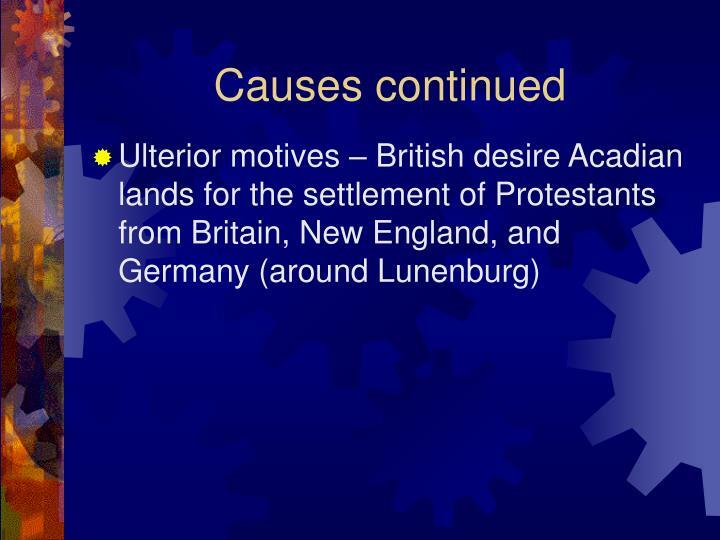 The colony remained mostly Acadian despite the establishment of Halifax as the province's capital, and the settlement of a large number of foreign Protestants (some French and Swiss but mostly German) at Lunenburg in 1753. 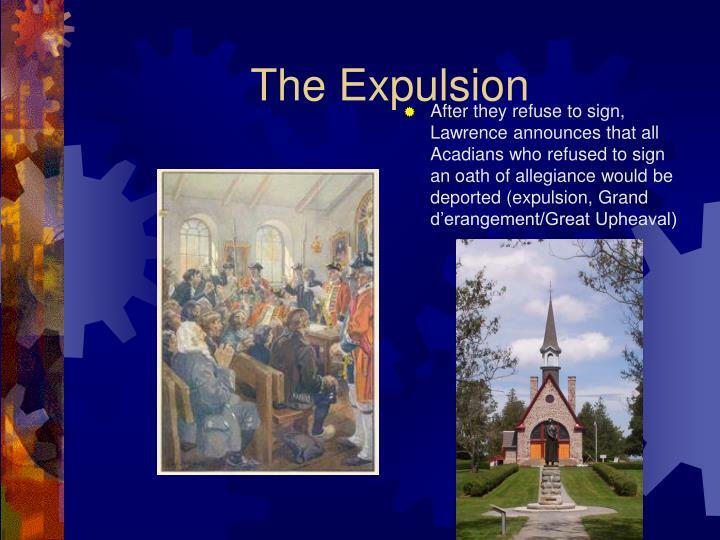 In 1755, the British forcibly expelled over 12,000 Acadians in what became known as the Grand Dérangement, or Great Upheaval. 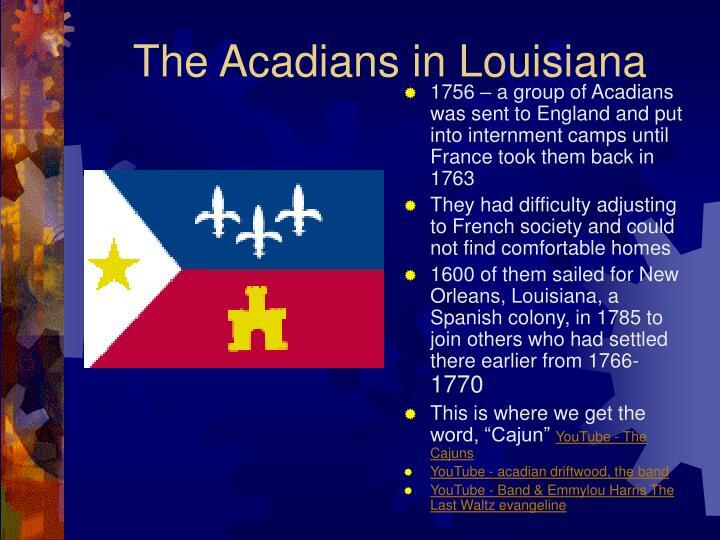 The Acadians were scattered across the Atlantic, in the Thirteen Colonies, Louisiana, Quebec, Britain and France. 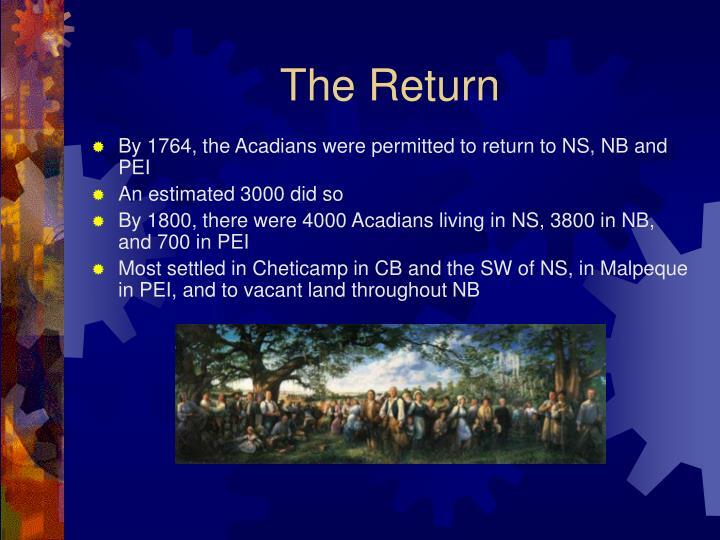 Very few eventually returned to Nova Scotia . 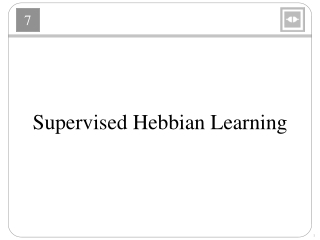 Gordon Dunsire -Linked data and the implications for library cataloguing: metadata models and structures in the semantic web. 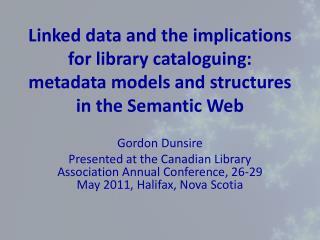 gordon dunsire presented at the canadian library association annual conference, 26-29 may 2011, halifax, nova scotia. 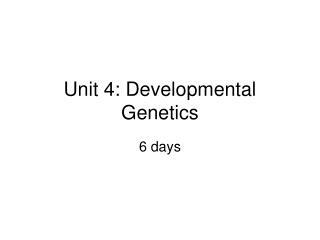 Unit 4: Developmental Genetics -. 6 days. 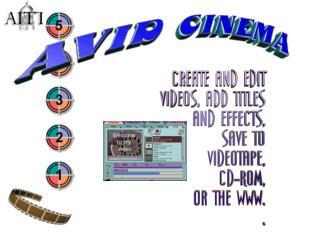 october 23:. birth defects. the medical impact of birth defects is considerable more than 20% of infant deaths are from birth defects an additional 20% may be caused by complications of pre-maturity. 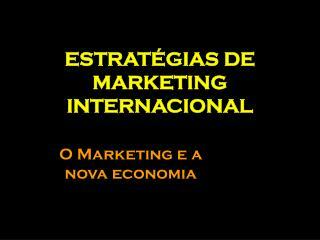 COMPETITIVE MANUFACTURING MANAGEMENT -. 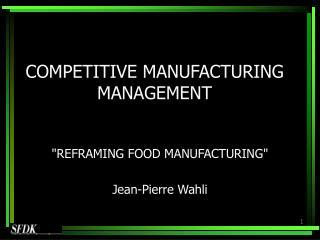 &quot; reframing food manufacturing &quot; jean-pierre wahli. uma dupla mudança. 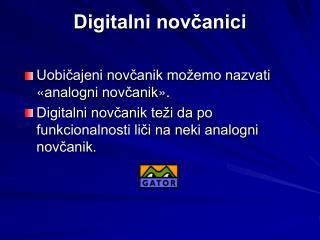 abordagem nova. m o d o d e p e n s a r. nova abordagem. abordagem atual. realidade nova. 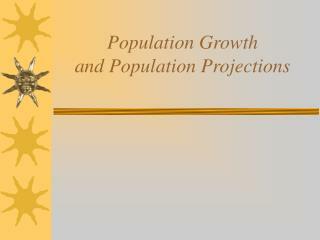 Population Growth and Population Projections -. birth intervals. 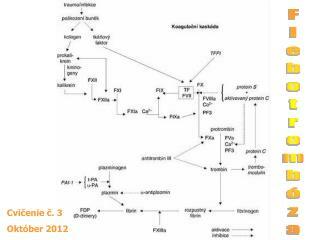 post partum ovulation time to conceive birth amenorrhea conception. 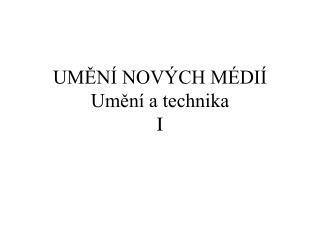 menarche. marriage. 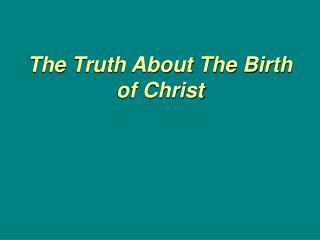 1 st birth. 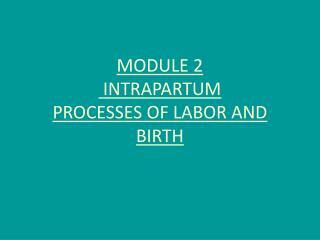 2 nd birth. 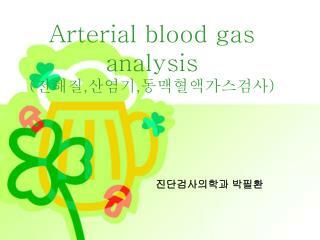 3 rd birth.